Funcom has released new Conan Exiles DLC, adding Khitai-themed content such as buildings with matching furniture and decorations, new Khitai patterned war paints, new ornate armors, weapons and more. The Imperial East Pack is the first DLC for the game and a part of broader post-launch plans. "We’re excited to have launched the first DLC for Conan Exiles, but DLCs are only one part of the post-launch strategy for the game,” said Funcom Creative Director, Joel Bylos. "We are also working on bug and stability fixes along with several free updates, including pets and taming, new dungeons, a new religion, and more. These are all large, game-altering updates that will be provided free to all players." 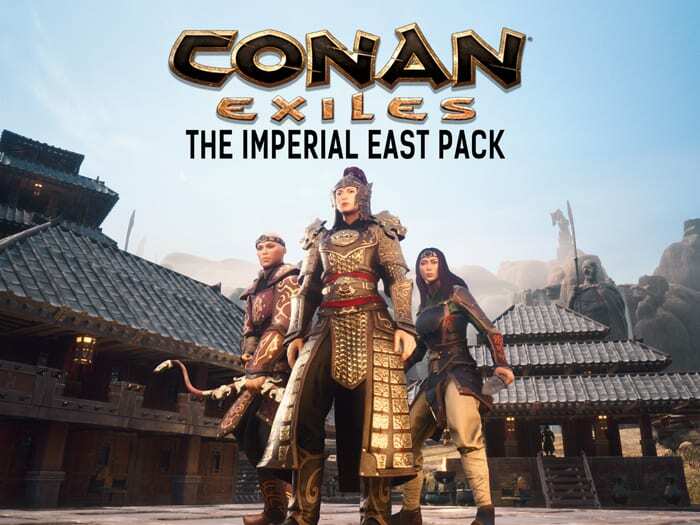 The Imperial East Pack is out now for Conan Exiles on Xbox One, PlayStation 4 and PC, priced $9.99/£8.99, bringing the eastern kingdom of Khitai into the Exiled Lands. Check out the DLC in the trailer below.